The perfect intersection of historic charm and upscale modernity happens where M Street meets Wisconsin Avenue in the heart of picturesque Georgetown. The beauty of Georgetown’s cobblestone sidewalks, grand homes and peaceful C&O Canal are only part of the draw to this tree-lined historic neighborhood – as home to some of the city’s top shops, tastiest restaurants and most luxurious hotels, Georgetown is a favorite of tourists and locals alike. And it’s easy to see why: Though M Street may be best known for a wide-ranging retail scene that includes such mainstream crowd-pleasers as Anthropologie and H&M and exclusive high-end designers like Billy Reid and Rag & Bone, the neighborhood is also home to a solid selection of upscale home design stores, independent small businesses and many of the city’s best fine art galleries. If shopping’s not your thing, there are plenty of other things to do, too. History buffs can tour stunning historic 18th and 19th century mansions or see the one-time homes of JFK and Julia Child. Foodies will find locally owned gems that appeal for a quick bite alongside world-class restaurants perfect for a leisurely dining experience. Outdoor and waterfront enthusiasts flock to Georgetown Waterfront Park for some of the most picturesque kayaking, jogging and cycling backdrops the city has to offer. By night, hit up the sprawling Pinstripes for a game of bocce or bowling, sip a drink riverside at one of the Washington Harbour’s waterfront bars or restaurants or take in a live jazz show at Blues Alley. 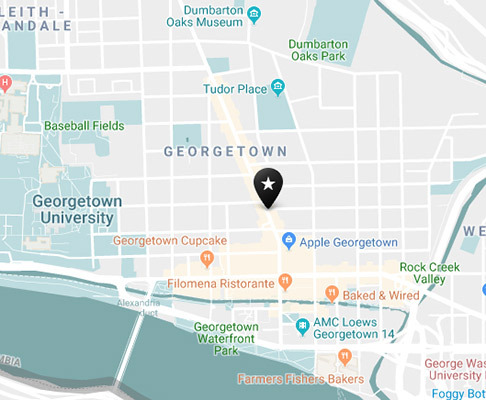 Check out the always bustling Georgetown Cupcakes or hit up the waterfront-facing Malmaison, a cafe that offers crave-worthy brunch favorites and delicious pastries. A couple of other unique and raved-about favorites: Fiola Mare at the waterfront, consistently ranked one of the city’s top fine dining restaurants and, of course, DC’s very first “cat cafe”, Crumbs & Whiskers, where you can enjoy coffee, pastries and snuggles with dozens of adoptable furballs. Scribbling messages on Baked & Wired's napkin wall, sandwiches from Stachowski Market & Deli, relaxing on the riverside patio at Tony & Joe's Seafood Place, walking through the Georgetown University campus. Take the Circulator's Georgetown-Union Station route or Dupont Circle–Georgetown-Rosslyn route into the heart of Georgetown, or take Metro’s Blue, Silver or Orange lines to the Foggy Bottom metro station and walk west on Pennsylvania Avenue from Washington Circle. This cyclist-friendly neighborhood is also where some of the regions’ best trails converge, from the C&O Canal Towpath and Capital Crescent Trails heading west, to Rock Creek Park Trail traveling north from the waterfront. Numerous public bike racks are located throughout the commercial district, in addition to Capital Bikeshare stations. Georgetown has a lot of charm. Sometimes it comes in the form of cobblestone streets, other times it’s an afternoon enjoying waterfront dining. Discover all there is to see and do in Georgetown by clicking below.